SYRACUSE, NY (WRVO) – The village of Sackets Harbor is losing one of the only stores where residents could get groceries, and its owner is blaming the opening of a nearby Dollar General as one of the reasons for its closing. Residents are divided between wanting to support local businesses and keep a small town charm, with the convenience and lower prices big corporations can offer. Malissa Bower is a cashier at the Harbor Market. She’s been working there for almost three years and said she’s sad to see it close at the end of the month. Business is a little slow at this small, neighborhood grocery store, which has been around for more than 25 years. One customer said she too is sorry it’s closing. Some people don’t have transportation, and depend on being able to walk here. Harbor Market was started by the Jefferson Rehab Center as a place to provide work for people with disabilities. Howard Ganter, CEO of the JRC and the Arc Jefferson-St. Lawrence, said the store has been losing $70,000 annually in recent years, for a variety of reasons. Competition came in, like a Nice ‘N Easy, which is now a Sunoco. New York State’s rising minimum wage increased labor costs. There was a change in some funding the Arc Jefferson-St. Lawrence receives from the state Office of Mental Health. And Dollar General, which sits just outside the village in the town of Hounsfield and opened a couple years ago, Ganter said, was the final nail in the coffin. Dollar General has been expanding in the North Country and across the U.S. They can usually sell name-brand and their own private products at cheaper prices, compared to the typical grocery and drug store. There are more than 15,000 locations and 975 new stores are expected to open this year. A decent amount of customers are at the Dollar General in Hounsfield. One customer in the parking lot proclaimed she loves it. The store has big new refrigerator and freezer units filled with food, and metal shelves with everything from cleaning supplies to beauty products. When it was first proposed in 2016, there was pushback from some in the community, who said it would kill local businesses. But Hounsfield Town Supervisor Tim Scee was a proponent of the Dollar General then, and still is now. Plus, he said, if residents in the nearby area stop there, rather than go all the way to Watertown for their goods, it increases tax revenue for the town. But Vince Battista, the former mayor of Sackets Harbor, said the closing of Harbor Market means a loss of tax revenue for the village. 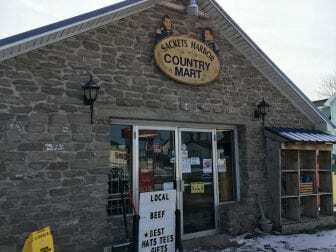 He and his wife have owned the Sackets Harbor Country Mart, a gas station and convenience store about a block away from Harbor Market, for 15 years. “Anytime there is new competition like the Dollar General store or Sunoco, it hurts the local businesses,” Battista said. He said he’s looking at the situation as an opportunity for him to start serving soup and lunches and to sell some of the items Harbor Market no longer will, as well as other products not found at corporate stores, like souvenirs. He said business is slow now, but it usually is around this time of year. Business is so seasonal in Sackets Harbor, he said it hasn’t been too hard to keep big companies away and maintain the village’s independence from a commercial perspective. R.D. White, who’s lived here for about 20 years, said after Dollar General rolled in, the closing of Harbor Market was almost expected. White said he’s heard someone might reopen the location as a locally grown, earthy type of grocery store, and if that happens, he said he’d like it.